A Pole Barn is a structure that has framing system built of wood roof trusses connected to vertical columns (sidewall posts) and which also has secondary structural members such as wall headers, roof purlins and wall girts to support the exterior cladding (siding and roofing). 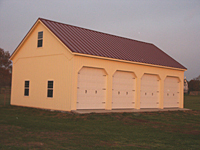 A Pole Barn (often called a Post & Frame Barn) is perhaps one of the easiest and most economical way to build a barn. Whether you are building a simple storage barn, garage, or a horse barn, a pole barn type of construction will definitely save you money and will still provide a very good and a solid construction. 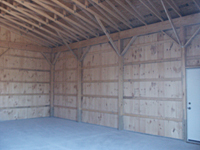 Post & frame barn construction is simple and does not require a lot of knowledge to build one. When building a pole ban, don't forget to properly brace your walls and roof trusses by installing all of the necessary braces. As you can see from this image, this barn has all the bracing in place. Braces don't cost much to install and should not be avoided. Properly braced pole barns can withstand significantly stronger winds and will give you peace of mind knowing that your barn will not collapse from any strong wind. 2x4 or 2x6 SPF wall girts are fastened on outside of posts and spaced 24" o.c. Perma Column is a manufactured concrete column with re-bars placed inside and with U-shape steel bracket on top. Perma Columns are designed to protect wooden posts from rotting and to eliminate the use of pressure treated posts all together. When Perma Columns are used, wooden posts are placed on top of these columns and attached with bolts. Glue Laminated Post is a manufactured post made of several plies of #1 Grade lumber. During manufacturing process, the lumber is glued and pressed together to form a uniform post. The advantage of a Glue Laminated post is that it's less prone to twisting, cracking and bending compared to a regular pressure treated post. In addition, it's also stronger. Double Bubble Insulation is a reflective insulation placed under metal roof to block heat transfer and to prevent condensation. It is a very good option for metal roofs and in our opinion, should be considered very seriously. 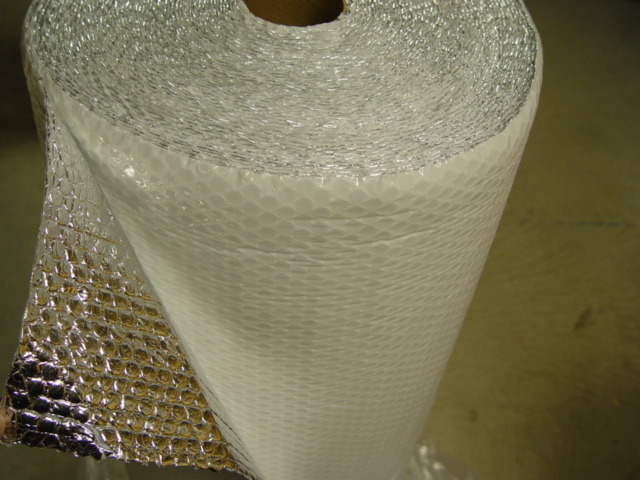 Price for this insulation is between $0.25 - $0.30 per sq.f.